Cross laminated timbers and innovations in timber construction have been building a stable following for a while now (no pun intended). One of the leading international proponents of the material is UK architect Andrew Waugh. 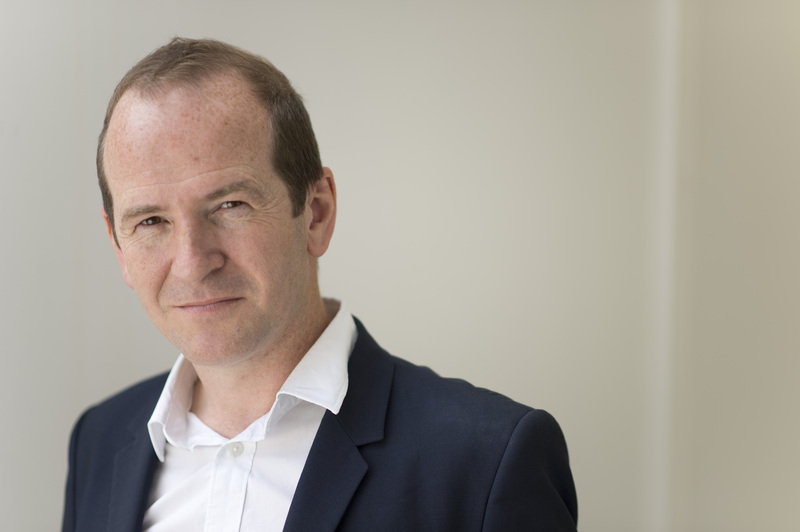 ADR talks to Waugh about the future of CLT and why architects of the 21st century should be sitting up and taking notice. Aleesha Callahan: In what ways can CLT be utilised? 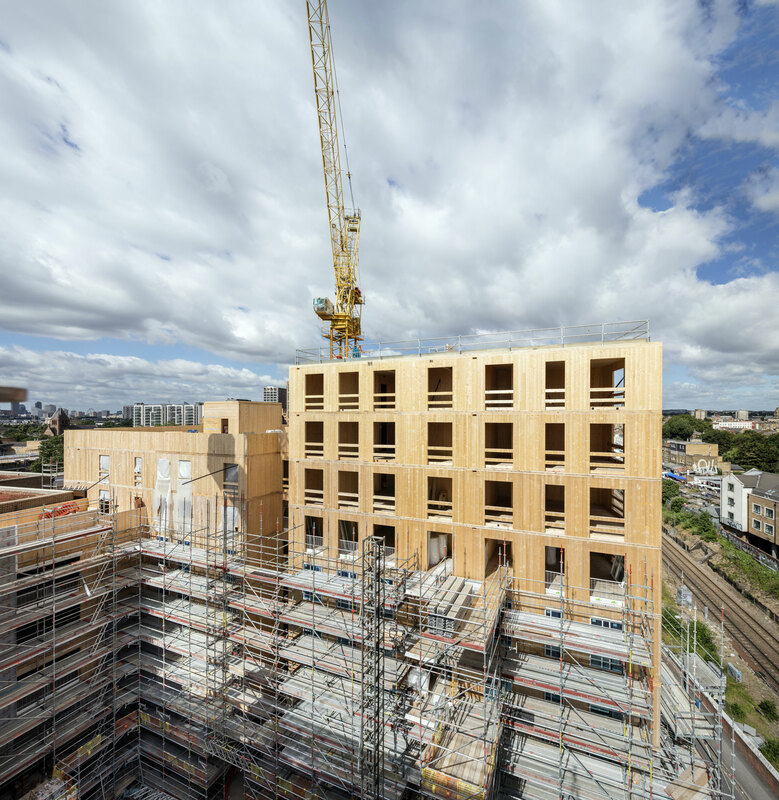 Andrew Waugh: In basic design terms, a full-sized CLT panel (16m x 3m) has cross-laminations with the planks in the panel running both vertically and horizontally. This means that the load path can be taken all the way along the panel, so although the panel acts as a wall, it can also be a beam while building with a material that weighs a fifth of what concrete weighs. It’s a lighter, stronger way of building. Plus prefabrication greatly impacts cost implications. Because it’s lighter and pre-cut, it simply arrives on site like an Airfix model just waiting to be screwed together, meaning you avoid lots of site waste and reduce deliveries to site by 80%. You’re also working with a non-toxic material, unlike a concrete site, you don’t need a mask or gloves to work with it; plus it’s much easier to fix into for the follow-on trades – plasterers, plumbers, electricians. So it’s cleaner, lighter, faster, easier and quieter. Dalston Lane during construction. Photo by Daniel Shearing. How is the process of working with it from an architectural point of view? Did it make you approach design differently? Yes, of course. For me, it’s a ridiculous notion that you wouldn’t actually consider the construction material when you conceive of the design itself. Nobody else would design something and then think, ‘what should I make it out of?’ I think that increasingly in architecture that is exactly what has happened to us – 100 years of building in concrete has made the profession lazy. The portfolio of images that one carries around as an architect is all about building in concrete. To begin to completely re-envisage and reimagine that is a process that takes an understanding of the material right from the get go. Which came first – modernism or reinforced concrete? Reinforced concrete is the essence of classic modernism. A factory-produced material that wasn’t about locally sourced materials and incited a change from a local vernacular to an international vernacular. That whole shift came with the internationalisation of a construction process. But what’s happened is that the architect is no longer the master builder and for many years hasn’t been involved in construction. So much so, that architects very rarely refer to themselves as being in the construction industry. They usually refer to themselves as being in the design industry. It’s a complete disambiguation from what, in essence, an architect should be doing. And also, in my view, what has happened is that architects have really refused to confront the issue of climate change. All they’ve done is put a solar panel on the roof, chucked in a bit more insulation and followed checklists (eg. LEED). Murray Grove by Waugh Thistleton Architects. Photo by Will Pryce. Architects are supposed to be the political design force, a process that truly engages with our time. It should be a cultural flagship and if climate change is the defining issue of our time, then architecture needs to be confronting that head on. Now we’re in a situation where the most carbon emitted is from the building materials that we build our buildings with. 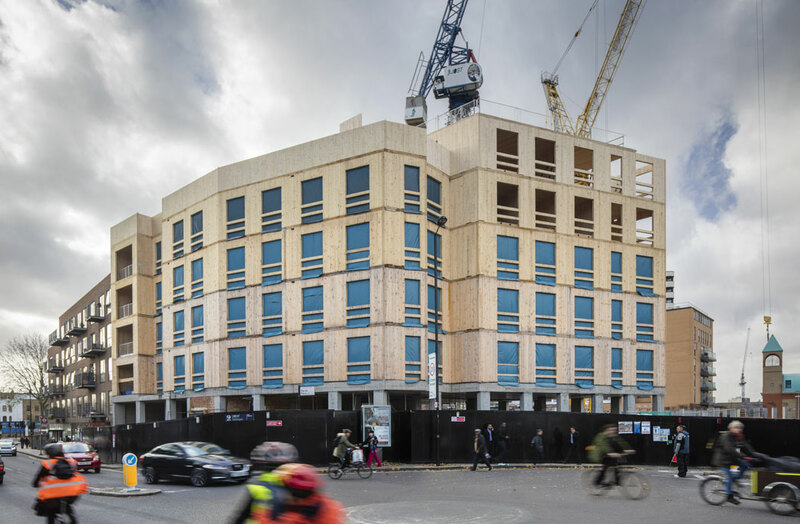 We need to get hold of that and produce a new architecture for the 21st century – one that reflects and recognises climate change and in my view, the only way to do that is through timber. What about the thermal mass of concrete… That has environmental properties? Thermal mass is a panacea trotted around by people who have been building in concrete for so long, so simply accept that thermal mass is a good thing. The thing about thermal mass is that it creates terrible urban heat islands. Massive overheating from the buildings over the summer occurs because concrete stores heat, meaning it constantly has to be heated up or cooled down. However, timber has a much slower thermal dynamic, meaning that it doesn’t take as much energy to heat it up and cool it down. Actually, a building without thermal mass can have more natural ventilation and is far more open to the elements. Another point around that is on biophilia and natural materials, which is something we’ve recognised for decades in food and clothing. The attachment to natural materials and the wellbeing that it creates in humans is beginning to be recognised. This notion that we’ve built these hermetically-sealed boxes that we spend so much of our time in, which then have to be electronically cooled down and heated up, really is an unhealthy environment to be in. 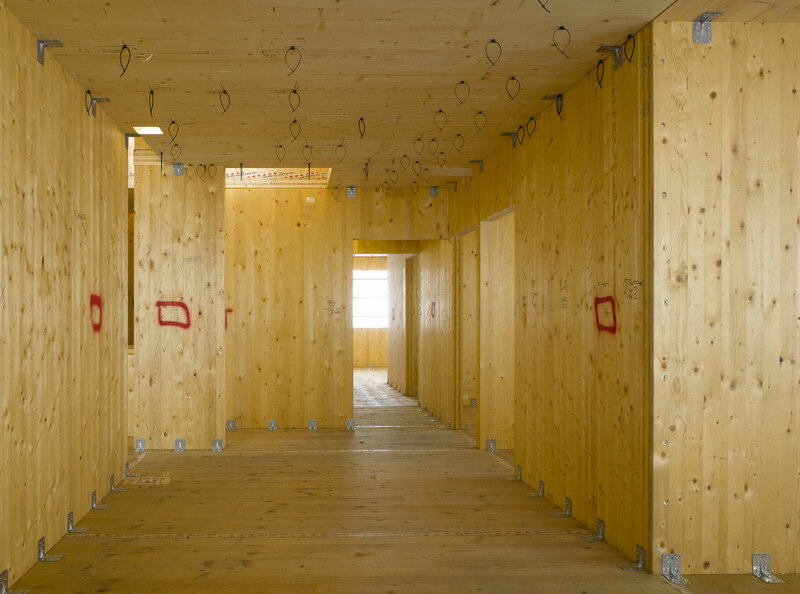 It has been clearly demonstrated that people in timber buildings are much calmer, much happier and much less stressed. The evidence is really clear that being in a natural environment is much better for humans. Murray Grove project. Photo by Will Pryce. What are your predictions on CLT into the future? I think the groundswell of interest in timber architecture is really taking off. One more recently completed test project that really pushed the boundaries of what’s possible is The Smile by Alison Brooks Architects, which really shows the versatility of the material. I think the use of CLT has already reached a tipping point. We’ve already done enough and built enough, so the nervousness that surrounded a new type of construction, a new type of building material, has fallen away – the only problem we have is perception. I also think that the issues around greenhouse gas emissions produced from concrete and steel will mean that they will become the cigarettes and oil of the future. We will be building completely in timber by the end of the century. From an architectural standpoint, the really exciting thing is to see what kind of architecture this new material brings. What kind of architecture will we arrive at in the 21st century from timber? 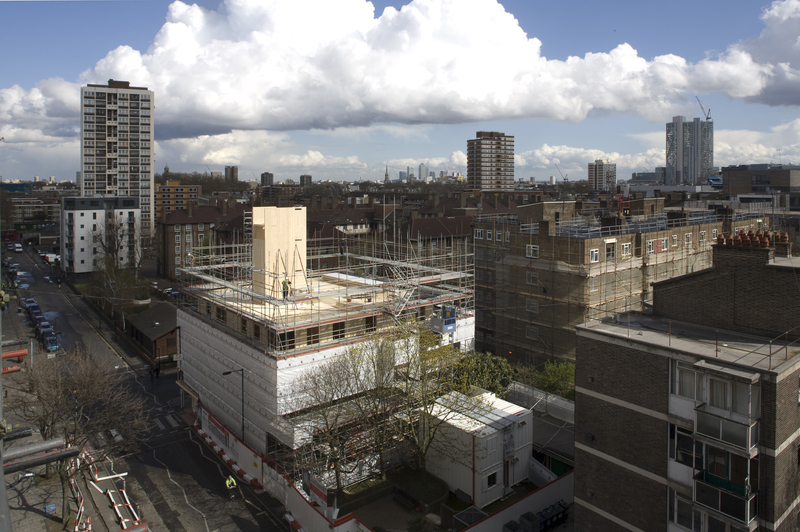 Waugh Thistleton Architects, London has worked across high density, mass produced housing using CLT. Fifteen projects have already been finished and the practice has another 20 on the books in NY, Paris, London and Stockholm.